If you are one among the thousands getting married this wedding season, here’s something you should consider. While money matters may sound impersonal when it comes to a close bond like marriage, they are as important as the emotional bonding of a relationship. 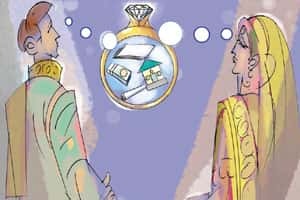 Says Jayant Pai, vice-president, Parag Parikh Financial Advisory Services, a financial planning firm, “Taking a huge high-interest debt for the wedding is a bad idea. In fact, if possible don’t sell your long-term investments either." So what do you do for cash flow? If you haven’t saved for the occasion yourself, borrowing from family and friends may work since such a loan would be interest-free. Pai says, “Ideally you should start saving for the wedding one year in advance. Borrowing from family is a good idea, but borrow to bridge a gap, or shortfall, don’t borrow the whole wedding expense from family." However, if that is not an option, selling your investments is marginally better than taking on a huge debt. The reason: you are young and will be able to earn and rebuild your investments. Taking a debt and hoping to use wedding cash gifts to repay the loan isn’t a great idea either. Pai adds, “You should not rely on cash gift to repay the loan, there is no guarantee that you actually get that much and you may get stuck for a long time." Financial compatibility: Apart from emotional and intellectual compatibility, it’s best to check each other’s financial compatibility, too, before the marriage. Says Sumeet Vaid, CEO, Freedom Financials Planners, a financial planning firm, “Both the parties should be transparent regarding their finances with each other, especially if it’s a double income household. It’s important to know how the other handles money, even before the marriage." Internationally, financial planners recommend that it’s good to run a credit check on your potential mate. Alternatively, you could help your partner get the required credit counselling before you tie the knot. After the honeymoon’s over, it’s time to get back to the grind. Starting early would help you ease the grind: while wealth creation can be larger and further goal, there are certain things that you must do first thing after marriage. Update financial documents: This is something we often overlook, but putting it in place is basic and mandatory. Pai says, “If you have your parents as nominees and want to change the nomination in your spouse’s name fully or partly, you will need to do the necessary paperwork." If both of you have moved to a new house, the address will also need to be changed across your investments and bank accounts. Also, women, who plan to change their last name, would have to do so even in their financial documents. And for this, they would have to get a new permanent account number card and a new passport, among other things. Even know-your-client norms would need to be adhered to all over again. Get a locker: Indian weddings are synonymous with gold jewellery and other precious gifts. To ensure their safety, apply for a bank locker as soon as possible since it may take some time before you get one. You can also consider taking jewellery insurance, which is usually part of the householder’s policy. Set financial goals: Setting financial goals, such as planning a kid would help you invest accordingly. As you settle in, you may look at short-term goals such a buying a car, going on a holiday or even consumer goods. While most people go for such goals, does it really make sense to buy a car or go on a holiday early on? Practically yes, but financially? Pai says, “If you plan to have such expenses early on, it’s best to save on the wedding cost. Alternately, you will have to postpone the gratification and invest keeping these short-term goals in mind. For short-term goals of less than three years debt-oriented investments work well." Make a budget: When you have just got married, between invitations for dinners to family and friends, you tend to splurge on everything—from eating out to going to the cinema to buying gifts for each other. At the end of three-four months, you may find your credit card bills soaring and your budget going haywire. To avoid such a situation, make a budget as soon as possible. Map out your expenses, in accordance to your expenses, investments and loans, but make sure you make room for some savings too. Initial investments: Also, if you have a lump sum saved for a specific goal, do not spend it all on things for the house such as furniture and consumer goods. Pai says, “If you have a lump sum amount and it’s not assigned to a specific financial goal, it’s all right to dip into those funds. But let’s say, you are saving for a long-term financial goal, then dipping into this to buy furniture is not the best thing to do." Get a financial plan: To make sure your goals, budget, expenses and investments are in sync, it’s best to seek professional help. Apart from helping you get suitable health and life insurance plans, a financial planner would help you look into important aspects such as building an emergency corpus. As predictable as it may sound, an emergency fund is a must in today’s slowing economy. Says Vaid, “Look at the potential risk you face as a family. For instance, if both the partners are working in a technology sector and both get laid off together, you will need an emergency fund to rely on." Ideally you should keep one year’s expenses aside. If that is too much for you, aim for at least six months’s expenses. The planner would also help allocate your investments and assets to cater to your short- and long-term goals. Team up now: Says Suresh Sadagopan, Mumbai-based certified financial planner says, “If both the spouses are earning, it’s best to maintain their individual financial identities, but some financial aspects need to be looked upon as a team. You could opt for a joint account to buy financial papers, pay equated monthly instalments on loans and the like, even as you maintain separate savings accounts." If you have separate accounts, make sure that you appear as co-owner on the papers. For big-ticket items like a house, irrespective of which spouse has made a contribution, ensure that the other spouses name appears as a co-owner. Remember that each household is unique and so are its demands, but the basics on which you need to work are pretty much the same. Best wishes for a happy life.